I have loved Elizabeth Hunter’s writing on fanfiction. She won an award in the first contest I hosted there as well as some other contests. She is also quite well known for her Elemental Mysteries series. Now, she is starting the Irin Chronicles and The Scribe is the first book in this new series. Wow. The world building is amazing, interesting but it didn’t take me out of the story, which means it was very well done. I don’t usually like stories with “angels” but I really liked this. It was a mysterious puzzle as I learned about how things work. The story is mostly in Turkey, primarily in Istanbul. The exotic setting with its historical touches is wonderful. Ava has been different her whole life, struggling with her differences and feeling alone. She has the advantage of her mother’s love and having money. She goes to a new doctor who helps her to feel better. She also meets Malachi who introduces her to a new world she didn’t know existed. Along the way, Ava falls in love. Malachi is a warrior in a world hidden from the humans. He and his brothers help Ava search for answers as to who and what she is. He is fierce and protective of Ava. He is strong and in control of himself. He knows from the beginning how he feels about Ava, never wavers and puts Ava before himself. That is hot. Their times together are deliciously sensual without being too detailed. As a reader, I learned about things as Ava learned. It happened at a good pace and I never felt bored or overwhelmed. I was enthralled with the story and my emotions invested with the characters. All the characters were well written. Even those such as Ava’s mother and step father, who are in the story only in phone calls, seemed real and complete. The characters captured me; none seemed cliché or flat. The bad guys are known and not known. The mystery of this will continue into the next book in the series. It is partially known from the history, which we get an introduction here, but there is a lot we don’t know yet. In the next book, there is much yet to discover about Ava herself. I was in suspense, feeling, caring, learning and swept along for the whole book. I will say the end is an appropriate stopping point, but I can’t believe it is the end. There is much for us to learn and feel and I want The Singer, the next book in the series and due out in May 6th of this year, NOW. Actually, the two links below are the beginning of The Singer and will help with the angst after you read The Scribe. And you want to read The Scribe because it is SOOOOO good. The Singer’s First Chapter here. Interested in winning a copy of The Scribe? Go here and enter! 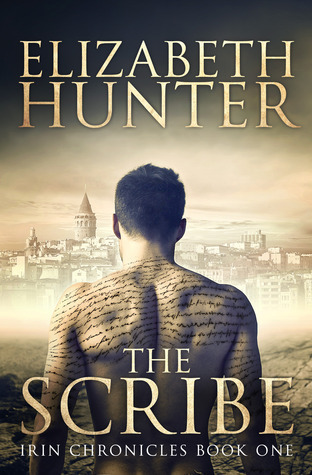 Share the post "Anne Reviews: The Scribe by Elizabeth Hunter (Irin Chronicles #1)"
Sounds good! Thanks for the review Anne. Ok, now I know which series you were referring to. I looks like I have to read this book. Great review and thank you for letting me know about it. I really appreciate it.